The Devas were tormented by the asuras. The Devas decided to come over to Thirumoozhikkalam and surrender to the Lord. They prayed to the Lord at the banks of the pond at Thirumoozhikkalam. “ Oh Lord. You are the only refuge to the needy, helpless and poor. The Asuras are dsperte to establish adharma (unrighteousness) while we are working to establish dharma. It is you who should save us all and re-establish dharma by attacking the asuras indirectly”. The devas did as instructed by the Lord. The King with the aavesha ( entry) of the Lord mounted a bull, attacked the asuras and won the battle. Kakuth means- The bull’s mound. As the king sat on the bull’s mound he came to be called kakuthstha. Thirumoozhikkalam was established by that king. He brought 1000 brahmanas to this place and made them do the Veda Parayana, recite Ithihasas and Puranas. Those who worship the Lord at this kshetra will beget success and success alone. SriKrishnapremi swamigal fondly called as SriAnna was born in Sanganallur, a small village in tamilnadu, India. Right from his early days he was a severe practioner of YogaSadhanas. This saint however wished to prove the world that the easiest way to attain the lotus feet of the Lord is nevertheless the path of Bhakthi. He revered SriBhagavanNama Bodendral as his Mansika Guru. He took to Srimad Bhagavatham as his pramana grantha [Authoritative treatise]. He founded a glorious sampradaya called PremikaSampradaya. [SriAnna is addressed as Premika]. SriBhakthaKolahalaKrishna is his Upasana deity. Paranur is a village near Villupuram. SriAnna built a wonderful temple for SriKolahalan in this small village. Thenceforth he started living there. He himself performed all the sevas to SriKolahalan right from Suprabhatham in the morning, the afternoon pooja, the evening rituals till dolothsavam in the night. Like SriThiyagaraja Swamigal who sang Utsava sampradaya keerthanas to his IshtaDaiva Lord Rama, SriAnna composed Uthsava krithis for the seva of SriKolahalan. [Suprabhatham to Dolothsavam]. Those Keerthanas are being sung till date during the pooja of the lord in Paranur. Besides this SriAnna has composed several Shathakas[A Shathaka consists of 100 Krithis] including 1. Raghava Shathakam 2. Radhika Shathakam 3. Yugala Shathakam 4. Govinda Shathakam 5. Ranga Shathakam etc. He has composed more than 1000 Krithis to date. It is definite that SriAnna visits Paranur every Ekadasi.There he follows `the Ekadasi Vratham in a strict manner, fasting, performing Abhishekam to Kolahalan, Pravachanam in the evening and Divyanama Sankeerthanam in the night. Gokulasthtami Utsavam is a grand affair in Paranur with 1000’s of devotees participating, Bhakthi overflowing through the streets. Navarathri Utsavam, Vasanthothsavam, SriRamanavami Utsavam, Keerthanavali utsavam, Thepothsavam are the othert festivals celebrated grandly at Paranur. SriAnna has also established a VedaPatashala at Paranur. There is also a Goshala beautifully maintained by him. These have been established by a trust founded by him. The trust is named “SriKrishnapremi Swamigal Baghavatha Dharmam trust”. This trust is run exclusively by the efforts of SriAnna. To conduct Bhavatham, Ramayana discourses. Renovation of DivyaDesa temples etc. Akhila Bharatha Sadhu Sangam functions in Chennai, Bangalore, Mumbai, Delhi, Tirunelvelli, Madurai, Pondicherry etc. SriAnna holds Brindavanam very close to his hearts. Hence he built an Ashram called PremaMadhuriKunjam in RadhaNivas, Goranagar colony, Brindavanam. Here he built an exquisite temple for SriRadhaVamsidhara Krishna. Here too like paranur the rituals take place according to Premika Sampradaya [ Suprabhatham to Dolothsavam]. The main festivals celebrated here are Radhasthtami, Rasothsavam, Holy, and RadhaKalyanam. Every year SriAnna visits Brindavanam four times for these Uthsavams. This Ashram is at Alagar kovil, Madurai. This picturesque Ashram captivates the heart of every viewer. The natural beauty of this Ashram with the green mountains behind it and flowers of various hues is the apt place for meditating on the lotus feet of the lord. Every Chithra Pournami Lord Alagar comes to this Ashram to the delight of several devotees. SriAnna conducts a Sapthaham during this time. This Ashram is being goverened by Akhila Bharatha Sadhu Sangam, Madurai. Melkote is a kshetram near Mysore, Karnataka. SwamiRamanauja retrieved the deity of this kshetram from the Delhi Badshah, after great efforts. Here again a beautiful ashram has been established. Chellapillai - as the deity is popularly known as, comes to this ashram in every July. This ashram is maintained by Akila Bharatha Sadhusangam Bangalore. There lived a saint by name Krishnasuri in Thiruchanganallur [Chenganur]. It is he who is called Periyavachanpillai in tamil. He has commented on the entire 4000 Divyaprabhandhams. SriAnna incarnated in his vamsa. 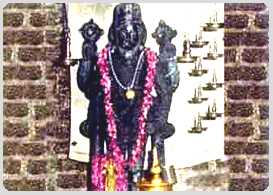 Periyavachanpillai had earlier constructed a temple for Lord Srinivasa. SriAnna too has built a small but beautiful temple for Pandurangan in this village. Besides this he has constructed a Mutt for PeriyavachanPillai. Periyavachanpillai too was born on a Avani Rohini incidentally SriAnna too was born on a AvaniRohini[Rohini star – Tamil month of Avani]. Hence on that day there is a procession of Periyavachanpillai to that Mutt built by SriAnna. Also every year it is routine that on January 26th the KalyanaUtsavam of LordSrinivas and Panduranga are conducted. SriAnna has written innumerable works in Sanskrit. To my knowledge after Valmiki and Vyasa he is the only person to write 40,000 slokas. Some of the important works are SriVaishnavaSamhita, Divyadesa Vaibhavam, Brindavana Mahatmiyam etc.He also has written works in various languages such as tamil, telgu, marati and the like. He also runs a monthly tamil magazine called BagavathaDharmam. SriAnna established an association called Bramhasabha to spread BagavathaDharmam throughtout the whole world. Bhajans, Parayans, Pravachans etc are being conducted at USA, Dubai etc by Bramhasabha members. Kalikalochitham Dharmam Naama Sankeerthanathmakam | Nirnethum Avatheernam tham Premikam Sadgurum Baje || I do Pranams at the Lotus feet of Sadguru Sri Krishna Premi Maharaj who Incarnated in this world to show the path of NamaSankeerthan as the only way to attain Hari in the Age of Kali .